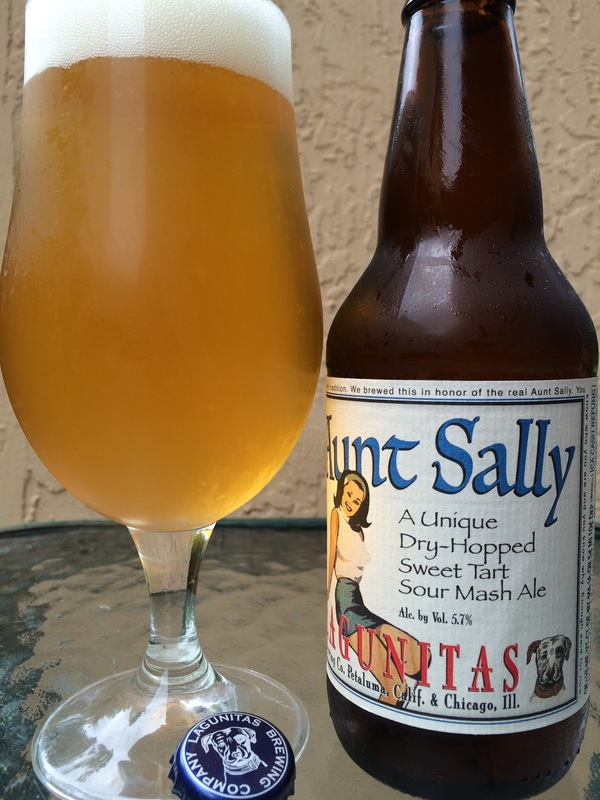 Today I'm trying Aunt Sally, a unique dry-hopped sweet tart sour mash ale brewed by Lagunitas. The Aunt Sally illustrated on the label is a babe, and as usual, Lagunitas adds a few lines to describe the beer and inspiration... "Our Aunt Sally is a tart, dry-hopped ale brewed in a bizarre old world tradition. We brewed this in honor of the real Aunt Sally. You know who you are and you know why. Enough said for now." 5.7% alcohol. 33 IBU. Lemony tart aroma with some sweet balance, and a lot of yeast too. Tart flavors to start but with some immediate candy sweetness behind that. Granny Smith apple sourness and citrus bursts. Candied hops. Pretty interesting but I can't help but sense there is some "dirty sock" type of funk there too that I didn't love. Tangy with some crushed sweet tart coated hops. Yeah. Check it out for yourself.